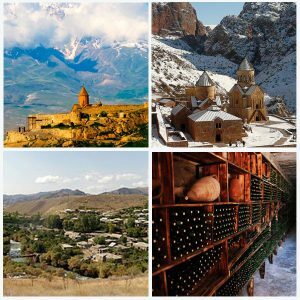 Zvartnots Cathedral, located between two capitals, current – Yerevan and former – Vagharshapat (presently Echmiadzin), is a UNESCO World Heritage Site. 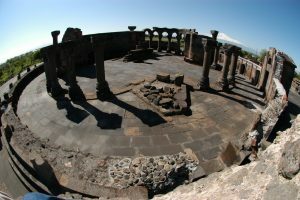 The archaeological remains of Zvartnots Cathedral graphically illustrate the evolution and development of a unique Armenian central-domed cross-hall type of church, which profoundly influenced architectural and artistic development in the region. 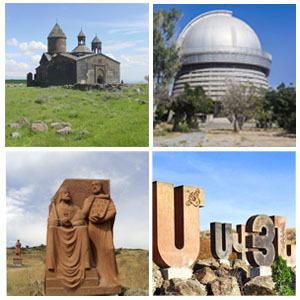 Zvartnots (Joyful) was built by Catholicos Nerses III, known as “the Builder”,on the spot where it is said Grigor Lusavorich (Grikor the Illuminator) met King Trdat III in 4th century, initiating conversion of Armenia to Christianity. However, the site had been a place of worship since pagan times, since the reign of King Rusa II (680-639 BC). 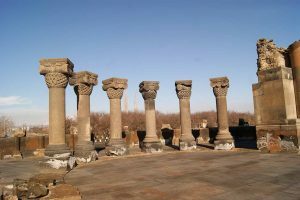 Excavations uncovered Urartian temple foundations, a sacrificial altar and a cuneiform inscription, celebrating construction of a large canal system, connecting to Hrazdan River, which is still in use. 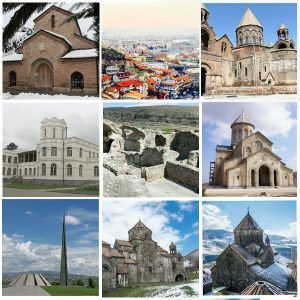 Zvartnots is unique as the only Armenian tetraconch church (a church of four similar-sized apses, one in each direction) and its architecture is drastically different in its appearance from the antique and Byzantine temples of this kind. 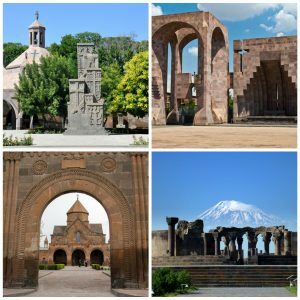 Although, built to stand “for thousands of years” and to awe visitors with its grandeur, the Cathedral remained erectonly until the end of 10th century, but the cause of its collapse is still unknown.The ruins of Zvartnots remained buried until its remains were uncovered at the start of the 20th century. Nowhere in the world can you see Mount Ararat as it is seen from Yerevan and its surrounding area. 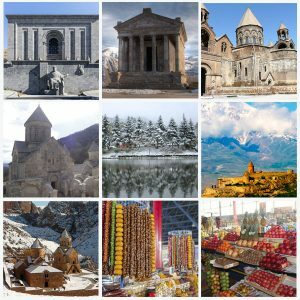 And if you happen to visit Zvartnots on a clear day, then you will not only be dazzled by the peaceful atmosphere and ruins of the temple, but you will also be overwhelmed by the most magnificent and noble sight – the image of majestic and magical Mount Ararat, every bit as mighty as its Biblical status would indicate. This image will forever remain etched in your memory.